The Portuguese water dog breed has been receiving a lot of press of late due to the US President, Barack Obama, choosing one as his ‘first dog’. However, there are other Portuguese water dogs making the news as well as the one currently residing in the White House. Cabrillo is one such dog, who received an award from the fire department in San Diego after he alerted his owner to a fire, which saved the life of his neighbour. The fire broke out on April 2nd while Cabrillo’s owner was asleep in bed. Cabrillo began to bark when he noticed that their next door neighbour’s house was on fire, waking his owner. Thanks to Cabrillo, the fire department was able to act in time and extinguish the fire, saving the life of his neighbour. Cabrillo received a box of dog treats for his actions (which he presumably didn’t eat all at once) and was made an honorary department fire dog. 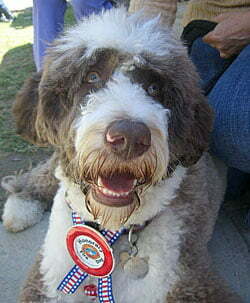 As lovable as that dog looks, he’s not as pretty as the Portuguese water dog in the White House! Then again, think I’d rather have a life saving hero… do they really not shed hair? That is a lie, some do and some don’t. It’s like a Labradoodle, Lab’s shed more than most dogs, and a poodle does shed, but you can sometimes find one that doesn’t, and their classed as ‘Anti-shedding’ dogs’ And this one would be a lot cuter if they guy did what the Obama’s do and don’t shave his eyes. He needs to see, and ‘Bo’ Can’t see with all the fur. Its horrid. Besides, black faced dogs are often more appealing.